Though situated in the centre of Portorož, the tourist pearl of the Slovenian coast, the apartments Lili nevertheless boast a quiet location amidst pleasant natural surroundings.Completely renovated and modernized, these four-star apartments offer best comfort and relaxation, which is something everyone needs in the stressful life we all lead today. The house features a fine exterior and a tastefully furnished interior. Its three air-conditioned apartments consist each of a living room, kitchen, dishwasher, bathroom, bedrooms and a balcony with a beautiful view of the bay of Portorož. 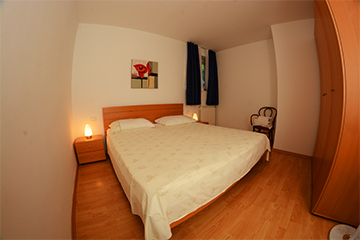 All apartments are equipped with cable LCD TV and free Internet. There are 5 apartments of different size. 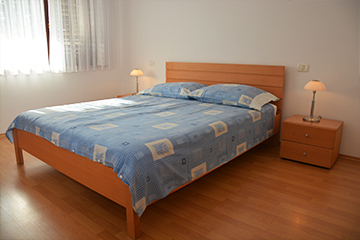 One apartment suitable for two persons, one apartment for three persons and three apartments for four persons. Guests have at their disposal several parking places. Apartments Lili lie 300 metres away from the centre of Portorož, where you can swim in the sea or sunbathe on the sandy beach, go night-partying or to a concert or a theatre, visit a gallery, go shopping, or choose a more active approach by taking advantage of the many water- and other sports activities offered in the resort. Also in the immediate vicinity are the Thermal Spa of Portorož, the Auditorium, the Bernardin Congress Centre, the Casino, and a number of local restaurants and bars together with various other tourist facilities. The location of the apartments Lili is ideal not only for those seeking entertainment but also for guests preferring long walks in the nature or cycling tours. The idyllic salt-fields of Strunjan can be reached by many walking and cycling paths, one of them leading through a tunnel underneath the hill of Portorož. Or, you can simply walk the three kilometres' distance to Piran – a small town with rich architecture and history, renowned as the birth place of the famous violinist and composer Giuseppe Tartini. If your wish is to get to know the whole Slovenian coast better, then you should take advantage of the many organized excursions by boat, or by tourist planes offering beautiful panoramic views of the entire coast, from Portorož all the way to Ankaran. The friendly staff of the apartments Lili will be happy to help you with any information you may require. Join many others that have already had a wonderful experience at our apartments.